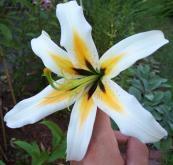 This is the flower of a plant from Leslie Woodriff that he sold to me as "Black Heart Orange Aurelian". I am not sure what it really is. 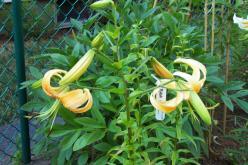 It has the form of a short Henryi, but also seems to have a tiny bit of fragrance. This is the Black Heart Orange Aurelian plant. 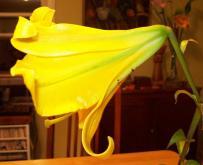 Note the short, stiff stem. This is Woodriff's Black Heart White. 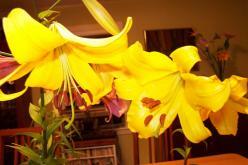 I received the bulb as a "gift bulb" with my first order of lilies in 1989. 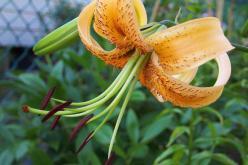 It is not a vigorous lily. This is a cross by Robert Walker, Yellow Herald Angels x Thunderbolt. 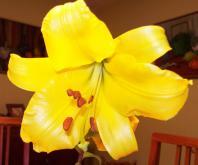 The flowers are a very bright yellow, with thick petals. A side view of Robert Walker's cross. Robert Walker's cross, and Gold Eagle.